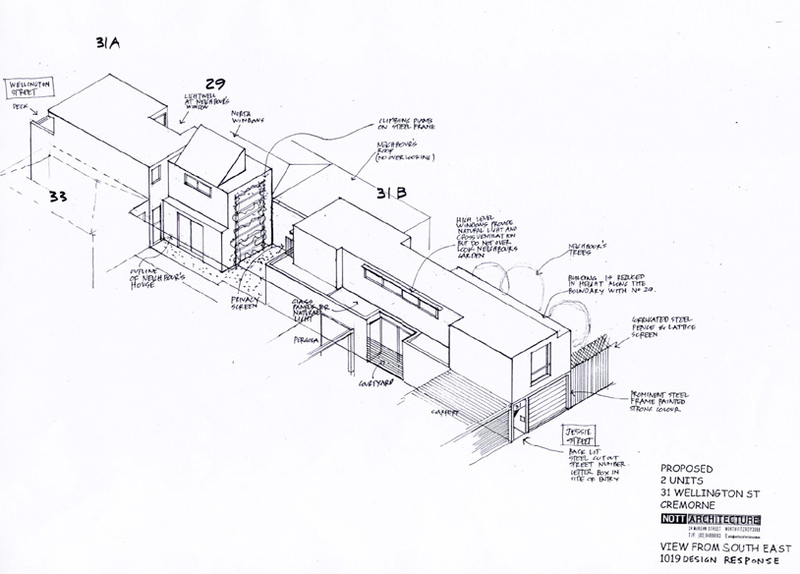 Applicant had purchased a terrace house in Cremorne with a site area of 202 m2 (4.68 x 40m). The site had dual frontage with Jessie Street at the rear. Wellington Street was not located in a heritage overlay with numerous dwellings in the street having been replaced or substantially renovated. The east side of Jessie Street was located within a Business 3 zone and occupied by various commercial and industrial uses. These were generally double storey buildings constructed to boundaries and often with undercroft car parking. Amendment C84 included the review site in the Burnley, Cremorne, South Richmond neighbourhood that contains an eclectic mix of commercial, industrial and residential use. The Cremorne area is identified as a truly mixed character with Victorian cottages, apartments and warehouse conversion intermingled with commercial and industrial uses.